Irritating controls and a costly update make this App one to avoid. 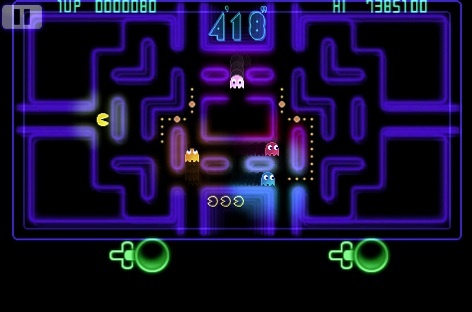 Namco Bandai was wise to bring PAC-MAN Championship Edition to the iPhone. The Xbox Live hit put a new spin on the familiar power pellet munching formula, complete with stylish neon graphics and a thumping soundtrack. We missed the sale a couple of weeks ago (the game was marked down to .99), but considering how much fun we had with the console version, the $2.99 asking price seemed justified, at least until we purchased the App and realized that the publisher wanted more. Oddly enough, Namco Bandai only sells a quarter of the game for three dollars. The rest comes with a $3.99 expansion pack, so you'll need over $7 (with tax) to play what Xbox Live users have enjoyed since 2007. So what does $3 get you? Twenty short levels in Mission mode, five stages in Championship mode and you can't even play Challenge mode until you fork over more dough. We don't know what bonehead made this asinine decision and it doesn't matter, because it casts a dark shadow over the game. That issue notwithstanding, Pac-Man Championship Edition received a low score mostly for its imprecise controls. Namco Bandai offers four unique control schemes (technically it's five, but one is a slight variation of the other) and none of them work particularly well. Regardless of whether you maneuver Pac-Man with an on-screen d-pad or finger swipes, it's much too difficult getting him to move in a desired direction. Left and right operate as they should, but instructing him to travel up or down usually results in disaster, as the yellow guy either goes in the opposite direction or fails to move at all, resulting in lost time and lives. In addition, the developers made the play area much too small, to the point that you may need to bring the iPhone close to your face to view the action. As for the rest of the game, Namco Bandai did a decent job bringing the content to Apple's device. Mission mode challenges you to complete a series of tasks to proceed. In one, you'll need to make a green apple appear and eat it before time runs out, while in another, you'll have to munch eight ghosts consecutively. Championship, meanwhile, forces you to achieve the highest score for each stage. On top of that, the game still looks and sounds impressive. We dig the neon visuals and imaginative boards, while the catchy audio sounds like nothing you've ever heard before in a Pac-Man game, so if anything, the developers got the bells and whistles right. We just wish Namco Bandai wasn't so greedy; the fact that most companies release free updates only makes it look worse. Pac-Man Championship Edition is much too costly to justify splurging, and the lackluster controls make it unappealing. 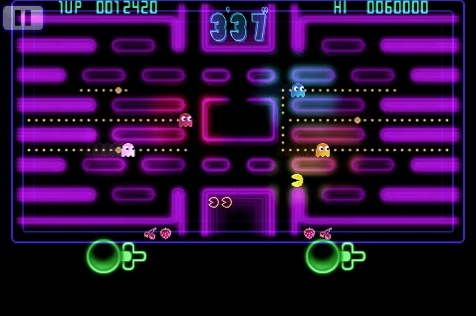 What's Hot: Excellent re-imaging of the classic formula, addictive Mission mode, neon graphics, catchy music. What's Not: Namco wants you to spend an additional $3.99 to unlock the rest of the game, imprecise controls.